yellow, pink, orange, red (recorded as deep red and red) and a final group comprising lilac, lavender and purple. The reasons for formulating this last group were firstly, that the numbers of any one of these colours was low and secondly that assessing the differences between them at the time of recording, in very varied light and weather conditions and subsequently using the photos, proved to be very imprecise. The colours of the selected seed parents were limited � mostly to reds, which however varied considerably within that parameter. So a distinction was made between those which were deep red and those of a lighter red. The same range of colours was recorded for the collar petals � however, there were none with deep red collars. Two other totals were recorded for each seed parent � the number of first flowers having no collar petals (and those with only rudimentary collar petals) and the number of flowers that had the same colour main petals and collar petals. For both the main petals and the collar petals, the number of flowers having two distinct colours was recorded. In each case the predominant colour was recorded in the data. These figures are represented graphically on the next page. The graphs for SUE MOUNTJOY (C) AND SUE MOUNTJOY (U) are very similar. Each of the other graphs shows much greater variations. This indicates that if these seed parents experienced pollination from different sources that it had minimal effect. If this is true then brush pollination and bagging would have no advantages over allowing natural pollination. Approximately 40% of the SUE MOUNTJOY seedlings had red outer petals -the most common collar petal colour was pink, so the parental colours were paramount. The collar colours were more evenly distributed than in any of the other seed parents. The incidence of flowers without collar petals for SUE MOUNTJOY was low (4 and 11%). At approximately 40% (45% and 35%) the incidence of flowers having the same colour outer and collar petals was high. Nearly one half of the seedlings had red outer petals while 20% were white. 40% of their collars were white and 20% red. Over 40% of the flowers had the same colour outer and collar petals. So again the offspring tended to mirror the seed parent�s colours. This seed parent yielded the lowest incidence of yellow outer and collar petals and the highest occurrence of red collar petals in the study. Only three of the 71 first flowers had no collar petals. The colour of this seed parent was distinctively different to the others in the study and one of the two non IJK varieties. The parental lilac and white was very evident in the seedlings. 32% had outer petals that were lilac while 26% were white. The figures were essentially reversed in the case of the collar petals with 37% white and 22% lilac. Compared to the other seed parents very few of the (A) flowers were red or yellow � orange was absent. Seventy of the one hundred and ten TA seedlings grown had flowers having the same colour outer and collar petals -�very much the highest in the study. One sixth of the flowers produced had no collar petals. While the great majority of flowers from this seed parent were white or pastel colours there were several that were strongly coloured � four were selected for trial in 2005. Also there was one with a red disc. Patricia is the other seed parent to come from a non IJK source. It had the poorest record in the study for producing seedlings with no collar petals � nearly one in two. Again the most common outer petal colour was the same as the seed parent � red, but in this case the incidence of red collar petals was also high. 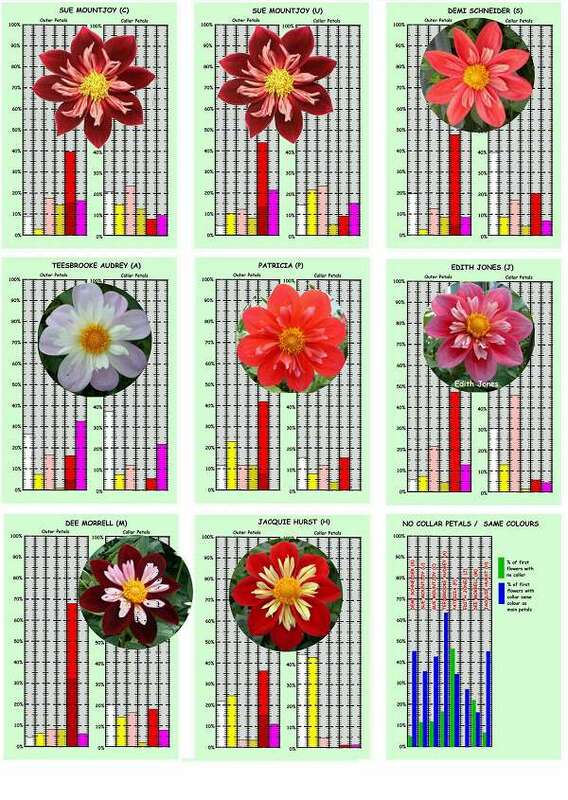 Nine of the fourteen flowers that had collar petals were the same colour as the main petals (64%). The eccentrics in this group were a red waterlily and (another) flower with a red disc. This seed parent is pink with a red blush increasing towards the centre and a pink collar.. The red component is very apparent in the seedlings outer petals � 44% but only 6% of the collar petals. The pink component occurs in 22% of the outer petals and 46% of the collar petals. So nearly 70% of the flowers had pink or red outer petals and over one half of the collar petals were red or pink. So here is a clear case of the seedlings mirroring the colours of the seed parent. Every one of the seedlings from Edith Jones had collar petals of at least one-third the length of the main petals � so a nought in the �No Collar� column. Just over a third of the flowers had collar and outer petals of the same colour. This variety has very deep red outer petals and pink collar petals. The deep red component in the seedlings was by far the highest in this study at 32%. Those categorised as red totalled 36% - so the appropriate column shows that 68% of the seedlings had red main petals. The collar petal colours were fairly evenly split between white, yellow, pink and red. So in this case only the outer petal colour of the seed parent was very prominent in the seedlings. Over a fifth of the seedlings were rated as having no collar petals. Only 16% had collar petals of the same colour as their outer petals � the lowest amount in the study. This is not surprising in view of the fairly even split of collar colours as referred to above. Another aspect of similarity to the seed parent is that all the seedlings were low growing with quite weak growth and much weaker stems than seedlings from the other seed parents. The main petal colour of this variety is a good strong red, while the collar petals are vibrant yellow. Again these colours predominate in the seedlings of which 36% had red main petals (fairly evenly split between deep red and red). 86% of the collar petals were either yellow or white (almost equal amounts of each). The significant difference from the other variety�s seedlings is that nearly half of these seedlings had either white collars and main petals or yellow collars and main petals (22% white and 24% yellow). So the total for seedlings having the same colour collar and outer petals is high and equal to the number of white/white and yellow/yellow flowers. Only six of the 91 seedlings had no collar petals. The seedlings selected for growing in 2005 were either all yellow or all white (one which had dark red main petals and white/pink collar petals was selected but the label was separated from the plant in a gale).